Earlier in 2018, Mazda sent us a Mazda 6 Signature Edition for test drive. It came in Machine Gray Metallic – which is probably appropriate for the revised Mazda 6 given its premium performance, refinement and value offerings for discriminating mid-size sedan buyers. Refined, elegant, premium, but for us, missing that touch of attitude we expect from Mazda. 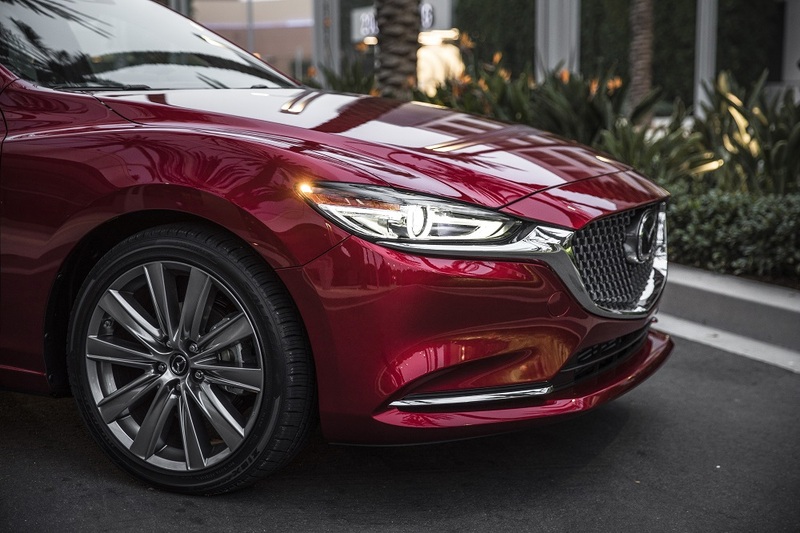 We like attitude in a sedan and for us, Mazda’s signature red exterior is the right dose of attitude. In our last report, we acknowledged we were convinced that the Signature Edition was their best yet and certainly the class of its segment even without the attitude. However, we suggested that some wheel time in a Soul Red Crystal Mazda 6 Signature Edition would satisfy our need for attitude. So, they did just that, sending us the Mazda 6 Signature Edition in Soul Red Crystal for another drive. Again, we enjoyed the snappy performance from the turbocharged engine, good handling and ride characteristics from re-engineered underpinnings plus the premium styling, technology and the ample room, convenience and comfort inside. This time though, we added attitude to our drive experience as we flashed by in the Soul Red Crystal Signature Edition. 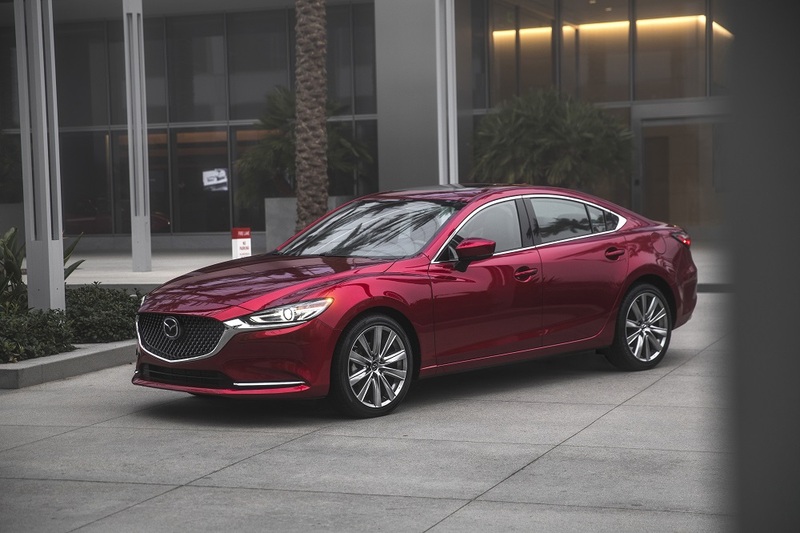 The 2019 Mazda 6 Signature Edition should be on everyone’s list for consideration when looking for value in mid-size sedan offerings. And, if you want some attitude to go with, we recommend the Soul Red Crystal color. 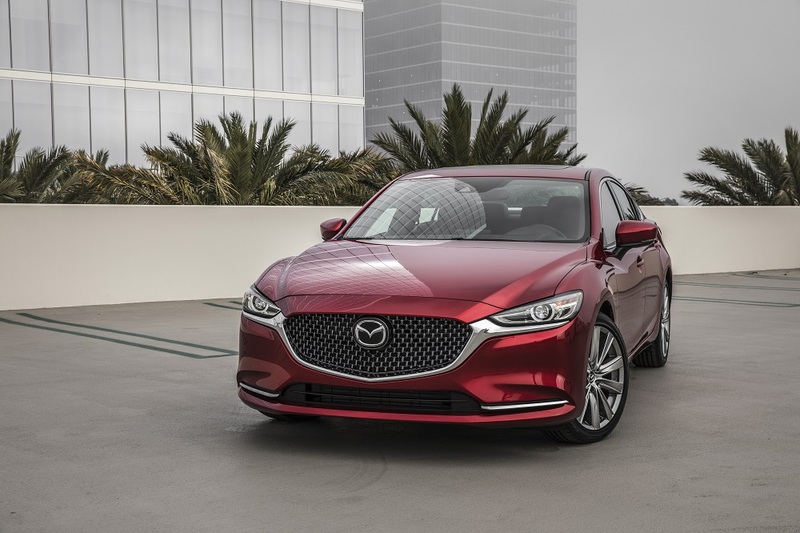 The Mazda 6 Signature is equipped with a redesigned bumper with LED Headlamps and Integrated Fog Lamps and a new Front Grille design in a refined Gunmetal finish. Other new or updated features include front and rear LED turn lamps, front and rear Parking Sensors, Windshield Wiper De-Icer and new design 19-inch Brilliant Silver Alloy Wheels. On the inside you find redesigned seating that is wider and more comfortable due to the new high-density vibration-absorbing high-density foam structural padding. The front seats are bucket-type with a recline feature and are heated (3-level) and ventilated front row with a heated outboard second row. Other interior elements of note include a refined Frameless Rear-View Mirror, Heated leather wrapped heated steering wheel with hand sewn Chidori stitching, Dual Automatic Climate Control with pollen filters and rear vents and a more premium black headliner. Taking cues from the success of the CX-9, Mazda reworked nearly every structural element of the chassis and suspension on the Mazda 6 line to deliver comparable Skyactiv-Vehicle Dynamics for 2018. Integrated with the standard Mazda G-Vectoring Control system, the Signature adjusts steering and powertrain response when cornering to further improve performance and stability around town and on the highway. This time the Mazda 6 Signature test vehicle came in their signature Soul Red Crystal color with the new – luscious – Deep Chestnut interior. Getting in and settling down, we were again impressed with the simple elegance of the linear horizontally stretched dash design. Complimented by the Chestnut Nappa Leather seating, matching Ultrasuede NU soft touch surfaces and the elegant Japanese Sen Wood accents all framed in rich satin chrome trims and highlighted with Power Moonroof – this interior is awesomely above class in its appeal. 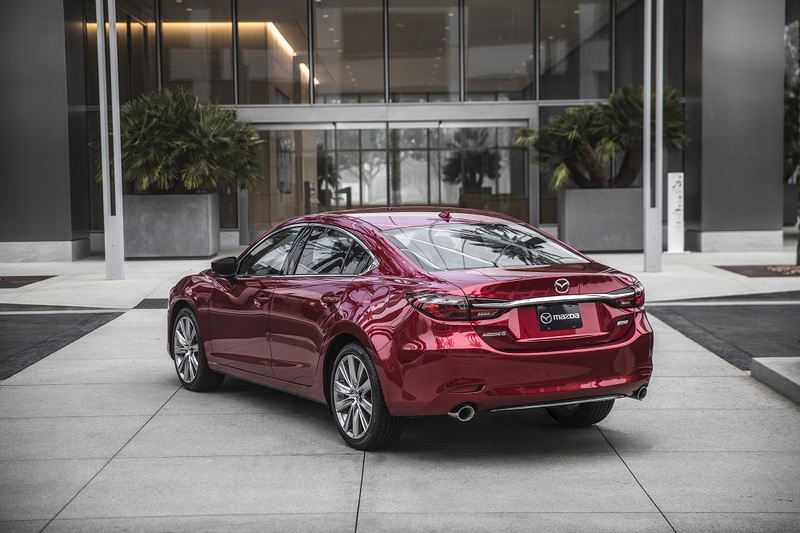 Our Mazda 6 Signature was powered by the newly available 2.5L SkyActiv-G Turbocharged engine producing 227 horsepower with 310 lb.-ft. of torque on regular gasoline. Mated to a 6-speed automatic transmission, it is fuel economy rated at 23/31 mpg city/highway and 26 mpg combined. 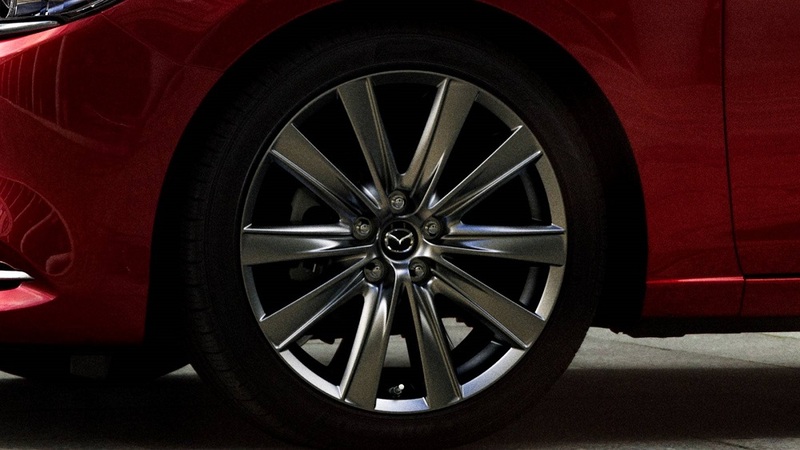 More than adequately powered and running on 19-inch alloy wheels mounted with P225/45 R19 all-season tires, the front-wheel drive Mazda 6 Signature delivers solid handling performance. The ride is enhanced with its monocoque unibody and front and rear suspension subframes design. Up front is an independent MacPherson Strut type coil spring with twin tube shocks and stabilizer bar. The rear features a Multi-link type coil spring and stabilizer bar setup. Steering is engine speed sensing Electric Power Assisted Rack and Pinion. Brakes are single piston ventilated disc front and solid disc rear with Electronic Brakeforce Distribution. Performance control elements include Dynamic Stability Control, Traction Control System and Hill Launch Assist. When you add the 8-way Power Driver and 6-way Power Passenger Seats, Steering Wheel Mounted Controls, Push-Button Start, LED interior courtesy lamps and a host of other convenience features, the Mazda 6 Signature is a true driver’s car inside. 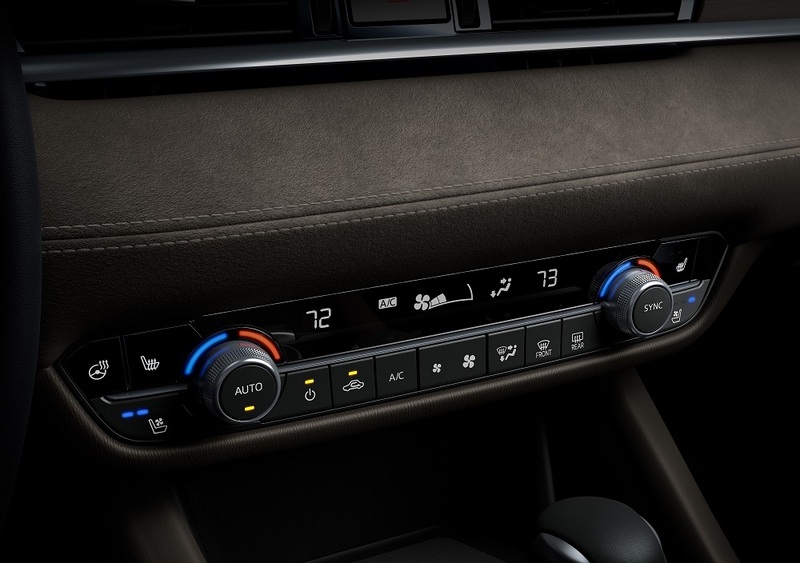 Convenience and technology elements included Mazda Navigation with 8-inch full-color touchscreen display, reconfigurable 7.0-inch TFT Driver Information Display, 360-degree View Monitor and Active Driving Head-Up display with Traffic Sign Recognition. The Mazda Connect infotainment system in our Signature was anchored by a Bose 11-speaker audio surround sound system featuring AM/FM/HD radio, SiriusXM satellite radio connectivity, Pandora, Stitcher and Aha compatibility, Bluetooth Hands-free Phone and Audio with USB inputs front and rear plus a 12-volt power outlet. Some other standard features on our Signature were RearView Camera, Blind Spot Monitoring with Rear Cross-Traffic Alert, Smart Brake Support with Automatic Emergency Braking, Radar Cruise Control with Stop & Go Function, Lane Departure Warning with Lane-Keep Assist, Adaptive Front-Lighting System, Automatic Headlights with High Beam Control, Rain-Sensing Windshield Wipers, Tire Pressure Monitoring System, and the bright Head-Up Display with Traffic Sign Recognition. And if all of that is not enough, loaded with safety features, the 2018 Mazda 6 Signature has earned IIHS Top Safety Pick designation for 2018. With just a couple of accessory items and an upcharge for the Soul Red Crystal exterior finish, our 2018 Mazda 6 Signature priced at $36,440. In our book, an exceptional value at all levels in its segment. 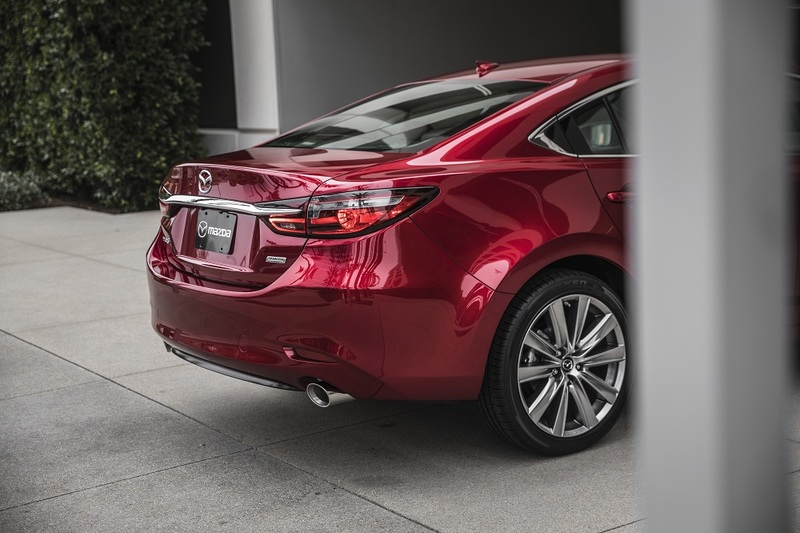 The 2018 Mazda 6 comes in five trim levels with a range of features similarly value priced across the line. The base Sport (MSRP $21,950) comes standard with a 6-speed manual transmission – the only model so equipped. A 6-speed automatic is available for $1,050 more. Both the Sport and the Touring (MSRP $25,700) are powered by the 2.5L Direct Injection 4-cylinder equipped with their exclusive Cylinder Deactivation that allows it to run on just two cylinders at speed. It delivers 187 horsepower with 186 lb.-ft. of torque. The Grand Touring (MSRP $29,700), Grand Touring Reserve (MSRP $31,700) – new for 2018 – plus the also new Signature (MSRP $34,750) are all powered by the 2.5L SkyActiv-G Turbocharged engine. Using their new Dynamic Pressure Turbo technology, it produces 227 horsepower with 310 lb.-ft.of torque on regular gasoline. Fueled up with premium gas and the horsepower climbs to 250. 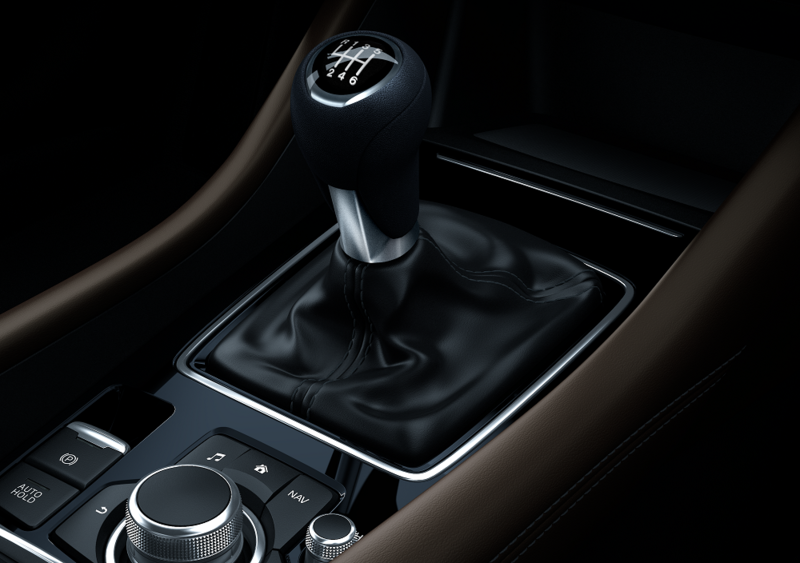 All three use the same 6-speed automatic transmission, uniquely tuned for the turbocharged engine, with paddle shifters and a Sport Mode. The Sport trim level runs on 17-inch wheels. All other trims run on 19-inch alloy wheels in Gun Metal or Brilliant Silver. Learn more about all of the trim levels here: https://www.mazdausa.com/vehicles/mazda6.